The Myth and the Prophecy of the White Buffalo: Sacred White Calf Buffalo Woman… One summer a long, long time ago, the seven sacred council fires of the Lakota Sioux came together and camped. The sun was strong and the people were starving for there was no game. Two young men went out to hunt. Along the way, the two men met a beautiful young woman dressed in white who floated as she walked. One man had bad desires for the woman and tried to touch her for she was beautiful. He was consumed by a mysterious cloud and turned into a pile of bones. The woman spoke to the second young man and said, "Return to your people and tell them I am coming." This holy woman brought a wrapped bundle to the people. She unwrapped the bundle giving to the people a sacred pipe and teaching them how to use it to pray. "With this holy pipe, you will walk like a living prayer," she said. Before she left, she told the people she would return. As she walked away, she rolled over four times, turning yellow, red, brown and then into a white female buffalo calf. It is said after that day the Lakota honored their pipe, and buffalo were plentiful. (from John Lame Deer's telling in 1967). Jamie Sams writes about the Prophecies of the Whirling Rainbow. It is said it will come in the form of a Sun Dog, a term that was given by the Native Americans, then adopted by scientists. This rare phenomena will be the language of the sky signaling a time that secret, sacred teachings are to be shared with all races. Many Sun Dogs will be seen around the time of the White Buffalo returning to Turtle Island (America). Enough children of the Earth will be awakened to carry the responsibility of the teachings and the healing process will begin. The illusion of separation will be replaced with the Truth of Unity. The Warriors of the Rainbow are the Sisters and Brothers uniting the Fifth world and working for peace. 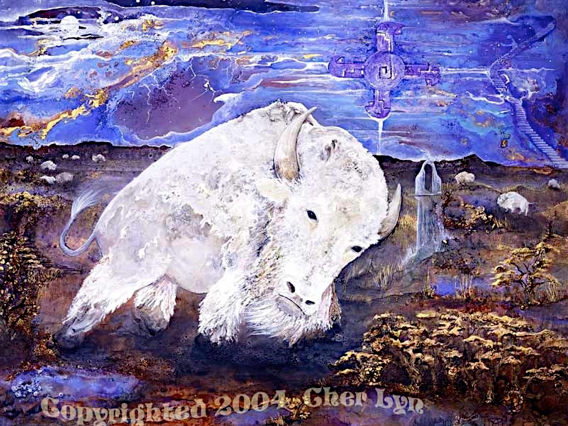 The return of the white buffalo calf symbolizes too the coming together of humanity into oneness of heart and spirit. Consider this: The chance of a white buffalo being born makes your odds of winning the lottery look good, the white buffalo’s likelihood, according to the numbers from the National Buffalo Association, is somewhere in the range of 6 billion. In 1997 Miracle Moon a white calf buffalo was born. "The arrival of the white buffalo is like the second coming of Christ, says a Sioux medicine man from Pine Ridge, S.D. It "will bring about purity of mind, body and spirit, and unify all nations, black, red, yellow, and white.” Grandfather Wallace Black Elk traveled to see Miracle Moon when she first arrived in Arizona, that night he had visions of herds of white buffalo and a male soon to be born. Now we see his visions coming into manifestation. Since her arrival there have been 9 white buffalo’s born at the same ranch. One white buffalo was a miracle, this is miracle Profundity. My introduction to the White Buffalo in 2002 seems to have changed me forever. I’d seen an article in the Four Corners Magazine that spoke about the White Buffalo living in Flagstaff, Arizona a little more than an hour away. I was very excited as I piled in the car with a couple I’d met in Sedona, and we made the exhilarating drive up Oak Creek Canyon while watching the dry desert quickly turn to mountainous tall pines in cool crisp air. Amazing. The sign read, “Home of the White Buffalo” as we pulled off the long two-lane highway. The San Francisco Peaks stood behind like guardians. We entered into the gift shop, a small very humble place. The caretakers, Jim and Dena greeted us with the story of how they had come to be the guardians of Miracle moon, a white buffalo, DNA tested four times just to make sure, she told us. Two more female and one male had been born from Miracle moon since they moved to Flagstaff from Wisconsin. She shared how their fur turned from yellow to red to white depending on the season and that underneath all that fur there was black skin. The four colors of all the races all coming together in one, a White Buffalo, just like the prophecy says. The story was fascinating, but it wasn’t until I met the White Buffalo in person, up close, eye to eye that I truly fell in love. Once I met them, they’ve been with me ever since. I have since made several visits to the White Buffalo, bringing my drum and songs, prayers in gratitude for their presence and purpose. I have found that the need to speak my truth was just one of the gifts she brings. My painting of Miracle Moon is to honour her return and her power. In the painting of “Miracle Moon,” mixed into the paint I used frankincense and the actual fur of the white buffalo blended with sacred water. I used my drum and native chants to honor her and call her in. A tarantella crawled out from under the canvas on the first day I started her. Native Americans say spider is linked to the past and the future and is associated keeping the feminine energies of creation alive and strong. I felt it to be a profoundly creative blessing. White Buffalo Woman comes from the Heavens on a stairway through the sky, traveling in on ancient star symbol. This symbol has the power of the universal creative forces within it. Miracle Moon comes to us with spiritual knowledge of how life works. She is a guardian and a gift-giver. She knows how to make miracles happen and she is willing to teach us when we open to receive. The emblem above her head in the clouds is an ancient symbol of Lemuria. This cross tells us that all Forces throughout the Universe have their origin in the Divine. All of the arms of the cross are symbols of the Primary Forces emanating from the Creator. It is said by the ancients to be His commands, His desires, and His wishes. The Four Great Primary Forces are all working in a circle from a center and proceeding in an Easterly direction, thus causing the whole Universe to revolve from West to East and all living moving spheres to revolve on their axes from West to East. The Star Being, White Calf Buffalo Woman signals a time of peace returning into our world once again. Miracle Moon is here as an omen bringing Abundance to all of life. White Calf Buffalo Woman is only one of many ancient prophecies that signal a time of the end of the old world and the beginning of the New. Peace, harmony and balance returning into our world where the rainbow full circle around our Sun spins once again. Buffalo Woman comes from the heavens on a stairway through the sky, traveling in an ancient symbol. "Your most precious, valued possessions and your greatest powers are invisible and intangible. No one can take them. You, and you alone, can give them. You will receive abundance for your giving."